I have been spending quite a bit of time talking about my 13 Week Menu Plan. While my menu plan only lists dinners we really do eat other meals here too 🙂 I have already done a post on what we do for breakfasts and thought I would also share about lunches. Just like for breakfasts, I don’t actually plan a lunch menu each week. Instead we have a list of lunches that we try to keep ingredients on hand to prepare. I’ll admit, lunches are often not very exciting but they are usually pretty tasty and easy. Depending on the busyness of the day on Sunday, we do try to have a brunch style lunch where I might take the time to prepare something that takes a bit longer. A leisurely brunch is easier to do in the winter than summer with our seemingly never ending list of projects to accomplish. I listed most of these items in our Breakfast List but I’ll repeat them here. During the week it is usually just Christopher and me home for lunch. Our first choice/option is leftovers from the night before. This makes a super quick and easy lunch that requires little thought. However, sometimes there are not leftovers so I actually have to make something. Quick and Easy Soup- I try to always have broth on hand so I can quickly put together an Egg Drop or simple vegetable soup. Another thing I’ve started to do sometimes if I know that I’m going to have a busy week and leftovers will be light (I can usually tell by my menu plan) then I’ll make a dish in advance and reheat as needed for a few days. I got this idea from a comment left by Michelle on a GNOWFGLINS post. A couple of things I’ve made ahead that work very well is The Prudent Homemaker’s Barley Soup and simple split pea soup. Both reheat very well. 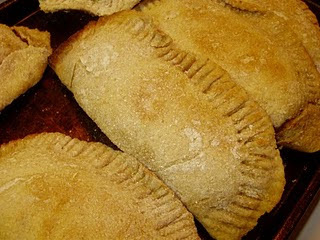 Sourdough Pockets are also a great make ahead meal and are even quite tasty cold. Precooking a roast or chicken for sandwiches also works very good. We love cold roast on sourdough flat bread topped with a yogurt/dill/garlic sauce. Yum! I just make sure all of the ingredients are prepared on Thursday or Friday. With warmer weather on the horizon I’m anticipating things like chicken salad, egg salad and salmon salad being wonderful make ahead lunches either on top of prepared greens or a homemade (sourdough) bread product. What do you do about lunches at your house? Do you have a system that works well for you that you would like to share? >Your sourdough pockets remind me that I need to make and freeze some Beerocks, those cabbage and meat-filed bread buns. Haven't made them in years. Thanks for the reminder!!! >Thanks for all the lunch ideas! Everything sound delicious! I am going to have to make some egg drop soup, I think… it looks yummy! >I make a huge batch (3 whole chickens) of mexican chicken filling and make chicken burritos. I wrap them individually and they can be heated up as needed. I have enjoyed reading about your experiences on your site. Especially enjoyed reading your menus an d comments of others. On March 24, 2011 , Kris Watson made a comment about making beerrocks. I am interested in her recipe because my Mom used to make them many years ago. I would appreciate receiving the recipe.